1.) Submit videos of your examinations via YouTube (see instructions below), pay the diploma fee on the BU purchase page (external web-link), and complete and submit the online diploma application form (Download). 2.) Visit a BU instructor (external web-link) and have him or her administer your exams. The instructor will then complete and submit the form and payment for you. 3.) Attend the BU Summer School Boot Camp (external web-link). You will take the exams at the end of school to earn a diploma in person. ﻿You will get better at pool in a smarter and faster way and raise your game to the next level. The diploma provides a concrete goal for measured improvement. 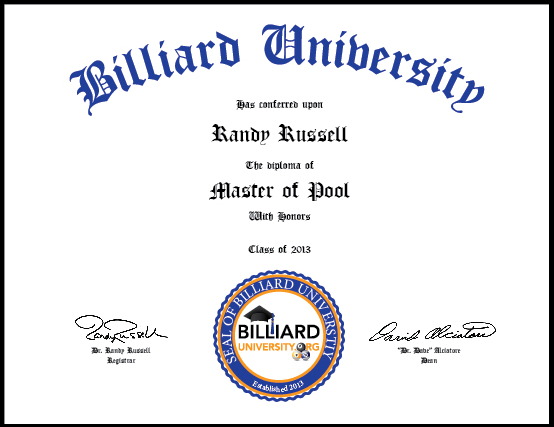 When you earn a diploma, you can frame and display it with pride (e.g., in your office or game room) to show off your enthusiasm and excellence for this great sport. With a diploma, you will receive official recognition (external web-link) of your level of ability on the BU website (with your permission).